Last year, millennials were nicknamed the ‘job-hopping generation’ after a Gallup report revealed that 6 in 10 millennials are open to new job opportunities. According to this report, millennials have a reputation for job-hopping and are said to move freely from company to company, more so than any other generation. That being said, I don’t think switching jobs is a trait unique to millennials only, even though they are said to job-hop three times more than other generations. The job market is ever-changing and is not like it used to be. Fewer companies offer pensions and some entry-level jobs offer very little benefits or stagnant wages. Self-employment, temporary work, and side jobs have all become increasingly popular work options. Also, there is less loyalty among employees who realize they can be laid off at any given time. At the end of the day, if you come across a better job opportunity that you think you’ll be happier with and has better pay and benefits, you may feel tempted to switch jobs and there’s nothing wrong with that. If you have a 401k however, you may be wondering what you can do with it when you do secure another job. You don’t want all the money you saved for retirement to go to waste, so here are a few options. Most companies will let you leave the money you saved for retirement in your 401k where it is. In other cases, there may be a balance requirement. Employees who move on to another company may choose this option out of default especially if they have no idea what to do with their 401k. The major downside is that you won’t be able to contribute to your 401k anymore. Also, you’ll have to keep track of more than one retirement account. If you tend to switch jobs every couple of years, you could wind up with multiple 401k plans that you can’t contribute to which is why it’s best to consider some of these other options first. If you had a good 401k plan with your old employer, you can easily roll it over to your new 401k. Check to see what the investment options are along with the fees with your new company. If you don’t like your current options as much as your old plan, consider rolling it over. Most employers will accept a 401k rollover. As long as you have at least $5,000 in your account, it’s your legal right to do roll it over. If you have less than $5,000 in your account, your employer will have the option to cash you out of the plan. If you’re going with this option, always ask for the rules to be clarified since you may have limitations since you’re no longer with the company. For example, you may be charged extra fees since you no longer work there. This is another option you’ll have especially if you don’t like your new company’s 401k plan. IRAs and Roth IRAs are great options that typically have lower fees and allow you to have more control over your investment options. With an IRA, you will just have more control overall. You can choose low-fee investments and won’t be limited to name just your spouse as your beneficiary like with most 401k plans. Keep in mind that there is a difference between a traditional IRA and a Roth IRA. With a traditional IRA, you contribute pre-tax dollars. The money is not taxable until withdrawals begin. If you withdraw funds before then, you’ll most likely have to pay a penalty fee. With a Roth IRA, your contributions are taxed when you make them so your earnings will be tax-free. Withdrawals are also tax free once you attain age 59 1/2. There are also income limits to be eligible for an IRA. In 2017, you must earn less than $118,000 if you’re single and less than $186,000 if you’re married. The maximum contribution you’re allowed to make per year is $5,500 and $6,500 if you’re 50 or older. This isn’t the best option, but it is an option nonetheless. If you want or need the money in your 401k account to pay bills, meet other expenses you have, or even to reinvest another way, you can simply cash out what’s in your retirement account. A major downside is that you will have to pay taxes on the money along with a penalty. If you cash out a smaller amount, what you receive will be even smaller. If you cash out a large amount, it won’t really be worth it due to your large tax bill. You could also destroy your retirement nest egg in the process especially if you received a nice 401k company match. 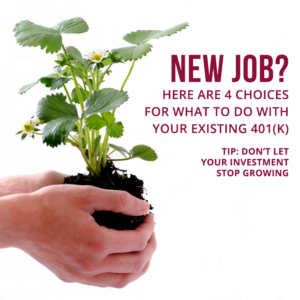 Depending on how many times you switch jobs that provide you with a 401k account, you may need to make the decision of what to do with your old 401k more than once. To determine which option is best for you, determine your current and future needs. Always consider factors like fees along with your investment options. I’m sure everyone wants to retire some day so it usually the better option to keep money from your 401k and roll it over or put it in an IRA.